AFTER A SUMMER of near-arctic temperatures in Berlin, the sun and art world simultaneously sprang back into action in early September, as an Indian summer guided us into the Art Berlin Contemporary (abc) fair and countless concurrent exhibitions: the fifth Berlin Art Week. The highlight of the calendar was Cerith Wyn Evan’s opening at Galerie Neu on a Friday night. The artist’s fourth exhibition with the gallery, he chatted away with Berlin old-timer Angela Bulloch while his suspended glass panels reflected his white neon sentences. 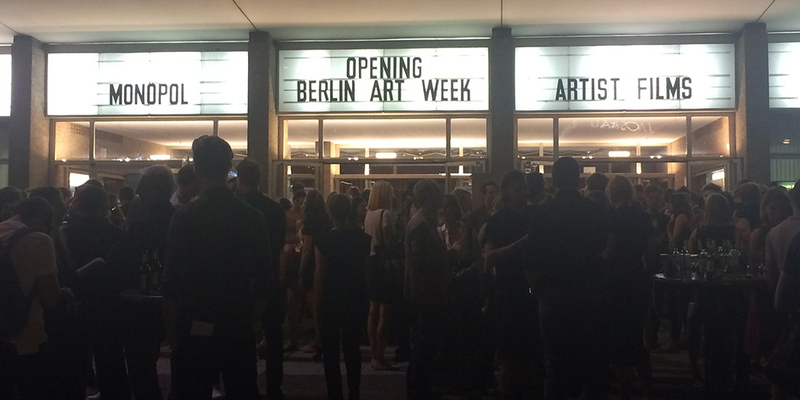 Fast-forward a few days and Kino International hosted the official Berlin Art Week opening party. With a thirteen-hour program of artist films including some by Wyn Evans, Christopher Roth, Olaf Nicolai, and Lawrence Weiner, Marc Glöde’s curatorial pièce-de-résistance was the glass cases out front containing 1960s videos by Bruce Nauman. Clutching galactic silver totes, VIPs included Centre for International Light Art director John Jaspers, whose upcoming retrospective of François Morellet presents works from 1960 up to the artist’s recent death. Next I peddled full pelt toward the Berlinische Galerie for Andreas Greiner’s opening. Recently awarded the GASAG Art Prize, his work straddles art and science and his giant 3D-printed skeleton of a chicken transformed the entrance hall into a pseudo natural history museum. Guests tucked into a kitsch array of food, pig’s trotters snuggled amid a lavish platter of meats. Left: abc director Maike Cruse. Right: Collectors Karen Boros and Christian Boros. Wednesday: sun, blue sky, and a frantic cycle to Akademie der Künste. Arriving late, I slipped into the Nasher Sculpture Center’s fascinating talk “The Work of Sculpture in the Age of Digital Production,” then took a skip and hop over to the Hamburger Bahnhof to catch Anne Imhof’s Angst II. 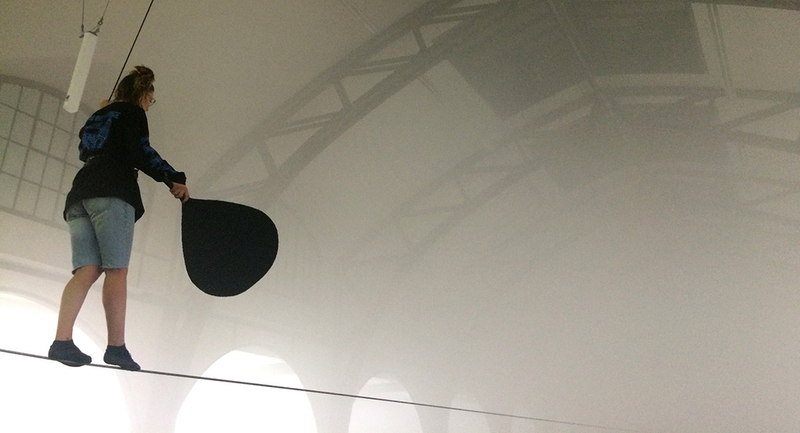 (Part one premiered at the Kunsthalle Basel in June.) Outside, hundreds pushed eagerly against giant doors. The floodgates opened and we poured into this “exhibition-as-opera.” Amid a vast hallway filled with dry ice, arrangements of falcons, drones, and musical choruses were juxtaposed with tightrope walkers and beautiful young performers sitting atop spiral staircases. Berlin stalwarts Eva and Adele emerged from the swirling smoke clad in pearls, pink lace, and blue eye shadow. Anne Imhof's Angst II at the Hamburger Bahnhof. Having sidestepped the characteristic fair fatigue (maybe less is more), I headed to Potsdammer Strasse’s Panama restaurant for Esther Schipper’s dinner in honor of Christopher Roth. His energetic dog charmed diners between courses of spiced cauliflower and chocolate fondant, after which I left to join artists Patrick Goddard and Christopher Kulendran Thomas at BRLO Brwhouse, where people had gathered post-fair for a pint and dance before bed. Following his recent exhibition at the Berlinishe Galerie, Erwin Wurm had time for a quick coffee at abc on Friday, where his fat VW van served wieners to fair-stompers. That evening was the night for gallery openings, which spanned the city from Marianne Vlaschits’s interstellar spaceship at Duve to Michael Fuchs Galerie’s “Exhibitions are the Best Excuses,” curated by Christian Jankowski, hot off the back of his Manifesta 11. Outside Barbara Wien’s Nina Canell exhibition, where coiled sculptures appeared as shed sheaths, I bumped into artist Olaf Nicolai and collectors Karen and Christian Boros. It seems Daniel Knorr’s Solo-Bunker was “impossible to buy because it only fits one person, but it’s a good piece,” the Boroses affirmed. Shame: no Russian-doll-style bunker within a bunker this time. Friday’s extravaganza dinner was hosted by Sprüth Magers and Esther Schipper, taking over the entirety of Grill Royal. “It makes sense,” Sprüth-Magers director Sylvia Baltschun told me. “We share the same guests anyway.” Over perfectly pink steak and béarnaise sauce, Philomene Magers glowed while discussing the recent opening of their LA branch, and their new show with “the amazing 1970s German Conceptual artist Hanne Darboven.” Sterling Ruby took pride of place at the dinner, his exhibition “The Jungle” having just opened. Collectors dotted around the room included Julia Stoschek, whose Düsseldorf-based museum recently opened a Berlin outpost, and while dancing ensued, I snuck out, using a haze of smoke swirling from someone’s pipe as cover. Left: Sterling Ruby studio manager Tyler Britt with artists Melanie Schiff and Sterling Ruby. Right: Sprüth Magers director Silvia Baltschun and dealer Philomene Magers. Last but not least we powered through to join the closing celebrations for the ninth Berlin Biennale at Kühlhaus Berlin. Revelers including American musician Ojay Morgan (aka Zebra Katz) were still on the dance floor, dreamily illuminated by blue lights, when I left at 4 AM. Perhaps they’re still there now, or drifting upon the Spree at the self-organized boat party I spotted posters for while stumbling home. This is Berlin, after all. Left: Import Projects director Nadim Samman, composer Tyler Friedman, artist Andreas Greiner, and dealer Jan-Philipp Sexauer. Right: KW director Krist Gruijthuijsen with e-flux cofounder Julieta Aranda. Left: Artists Christopher Kulendran Thomas and Patrick Goddard. Right: Julia Stoschek Collection director Monica Kerkmann with collector Julia Stoschek. Left: Kasper König, Jörg Heiser, Rachel de Joode, Jed Morse, and Bettina Pousttchi. Right: Artpress’s Ute Weingarten (left), and John Jaspers, director of Centre for International Light Art (right).